This past week, I officially became a paid (!) teaching assistant (TA) for an undergraduate course: Food and Communications. I'll be helping my former professor with two of her other classes as well, but this one is the one I'm most involved and interested in. Surprise, surprise, huh? I'm very much nerdily excited. "Food systems are, like myth or ritual systems, Douglas says, codes wherein the patterns by which a culture 'sees' are embedded." " Reciprocal gift exchanges, often of food, bind members of a society together in relations of mutual participation and unity," (Mauss). "Eating is understood and analyzed by Robertson Smith as a way of establishing physical unity not only with the deity but also with one's fellow humans." "In the act of eating [in the Hua conception] one is connecting oneself with the world, opening one's body and one's self to the dynamic influences of properties, vital essence, and emotions of other organisms." In general, I approach food in four ways: nutritionally, based on cravings, for convenience, and/or in the spirit of tradition. This is why eating, for me, is such a vital part of any travel experience. I put aside most of my food-related habits in order to embrace those of the people raised in the place--thereby, beyond simply enjoying their culinary delicacies, understanding (or at least, exposing myself to) their culture even further. On our Saturday evening in Marrakech, Leslie, Anna, and I headed to Jemaa el Fna. Each week, in this large historical square, local restaurants set up stalls to serve dinner. Anna's handy guidebook advised us to focus on those stalls which were visibly popular with the Moroccan community for the best and most fresh food. I'm pretty sure we began with bowls of Harira (tomato-based, chickpea) soup. I'm only uncertain because we didn't ask :) just ate. Next, we ventured to another stall for our main course. I enjoyed a bowl of beef couscous and roasted potatoes... which both went un-photographed because I simply ate it too quickly. To wrap up our dinner adventure, we walked over to the carts serving mint tea and dessert. I opted to try what I believe to be similar to these Moroccan-Date Bonbons. And, I didn't like them, at all. Honestly, when it comes to dessert, I mostly just love chocolate. Furthermore, I wouldn't consider myself a big fan of Moroccan food in general. My palate just doesn't understand why fruit has such a prominent place in savory dishes, and apparently it doesn't understand desserts spiced with cardamon either. I do appreciate Moroccan cuisine a whole lot more though. Begrir or Moroccan pancakes, for instance, are amazing; especially when paired with fresh, salty eggs, natural strawberry marmalade, sesame bread, and the best fresh-squeezed orange juice... ever a.k.a. 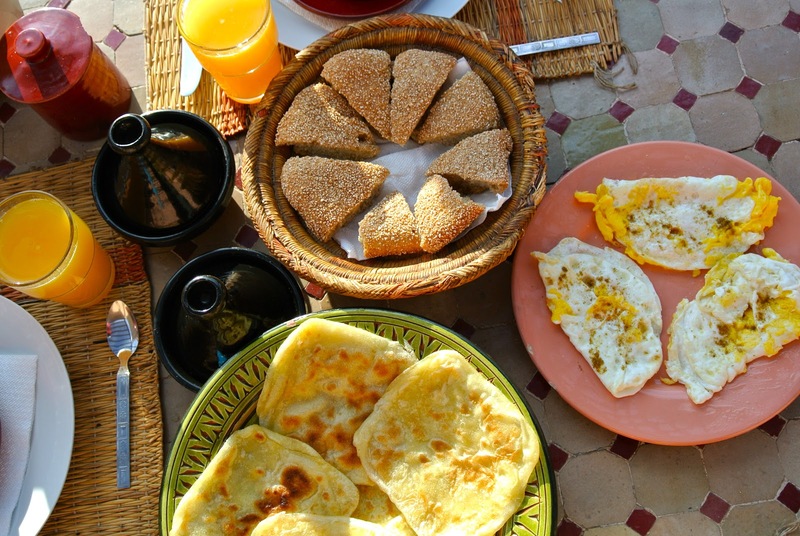 the phenomenal breakfast at the riad. I've also discovered how freaking good a tagine--a slow-cooked dish with traditional spices, tender braised meat, aromatic vegetables, and sweet prunes--could be. 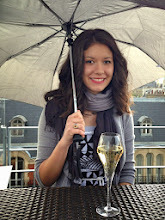 We spent our Sunday exploring the "new city" and stumbled upon an unassuming Café Bourneix. Their beef tagine, the second of my 3 courses, was fantastic. Unfortunately or not, besides these two "authentic" meals we dined at restaurants which visibly catered to tourists. It seemed as though the only eateries flanked with locals served fast food... even if there was great Moroccan food to be found elsewhere. This led me to hypothesize that eating out didn't have the same significance to Moroccans as it does to Leslie, Anna, and I. I could be wrong or I could be right, I don't know. Either way :) it was a wonderful experience. I have one last Marrakech sight to share and then it's catch-up Parisian time with a bit of news. Wishing you a great weekend! I'm off to visit my French family in Melun. I think your instincts are spot-on, because I do recall reading in our trusty Lonely Planet that eating out really isn't a big thing in Moroccan culture. People are more likely to invite people over to their house and show off theircooking skills. I am rather pleased with our food selections in Marrakesh- I really think we covered a wide range of styles/levels! Go me ;) and more importantly, us! I too think we made great choices.